Nolitours & Transat HolidaysAs planeloads of winter-weary Canadians head south for a mid-winter break, there’s a good chance that they’re headed for the airport at Puerto Plata, one of the budget destination capitals of the Caribbean. To be more precise, they are almost certainly headed for one of the all-inclusive resorts at Playa Dorada, a massive gated resort complex on a long stretch of golden sand beach just minutes east of Puerto Plata. From a tourism perspective, Puerto Plata and Playa Dorada is one region. Luckily, this area has got it all: history, watersports, food, music, nightlife and the beautiful beaches that the Dominican Republic is known for. The dizzying selection can be a bit overwhelming. Point clients in the right direction using our Puerto Plata Primer. In the times of Columbus, pretty Puerto Plata was a major port for ships heading from the New World to Spain laden with a cargo of silver (the name means “port of silver”). The historic heart of the Old City is the charming Parque Central Independencia, a town square bordered by grand Victorian buildings that were once homes to wealthy landowners and trade merchants. The park is a popular stop on most city tours; many of the stately Victorian buildings have been restored and are now home to the City Hall and Palace of Justice. Close to the park is the unique two-steepled church, Iglesia San Felipe, known for its stunning Italian stained glass windows. The compact Old City is easy to navigate on foot – especially the spacious Malecón, the seaside boardwalk that is the centre of the city’s social life. When the sun goes down, bars, restaurants and food stalls along the Malecón bring energy to this part of town. 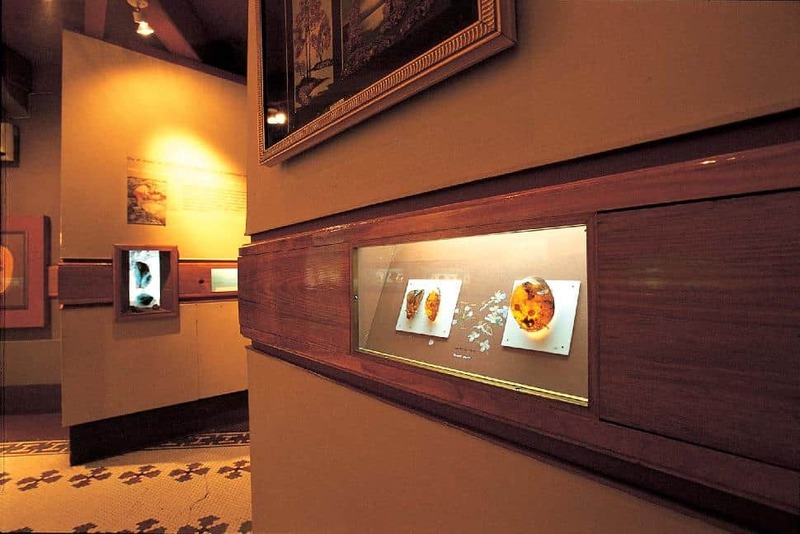 Just a few steps from the Old City is the Dominican Amber Museum with its unique collection of amber pieces. Included in the displays are leaves, ants, wasps and a perfectly preserved lizard, all caught in pieces of clear, golden amber. 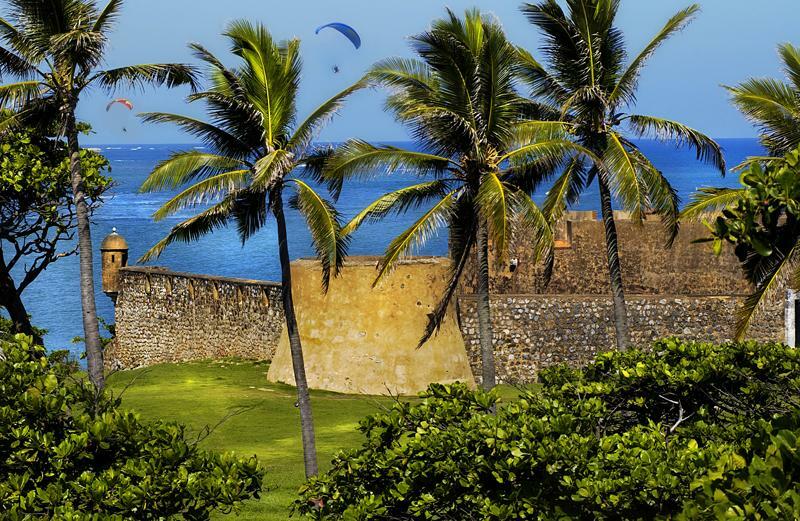 The city’s last remaining colonial structure is the 16th-century Fort of San Felipe, built by the Spaniards on the waterfront to fend off pirates and attacks from the sea. Today it houses a small museum. Rising behind the city is Isabel de Torres Peak. 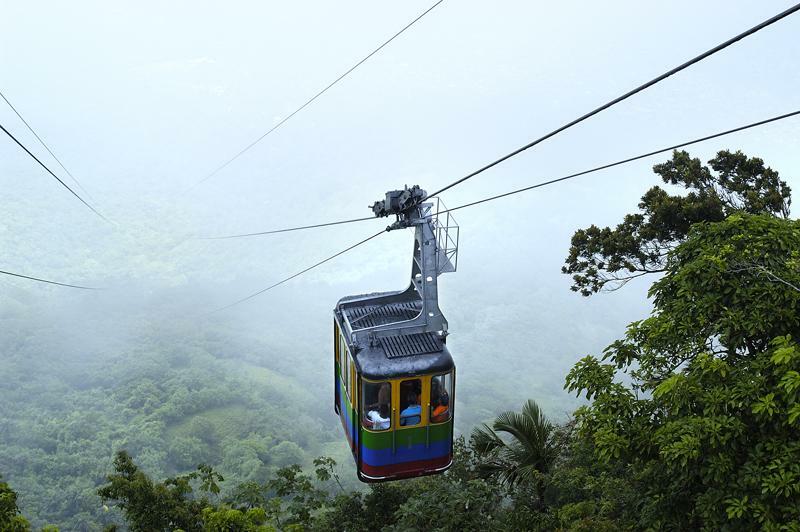 Visitors take a popular trip by aerial cable car to magnificent views from the top, a botanical garden, and to the Christ the Redeemer statue (a scaled-down version of the one in Brazil). Puerto Plata is also the cultural centre of the North Coast. The area hosts both the annual Dominican Jazz Festival (each November) and the lively Carnival celebration, a tradition inherited from the Spanish forefathers (February and March). This is the place for people who crave long stretches of golden sand and the lure of high adrenaline watersports. The coast of Puerto Plata and Playa Dorada catches the trade winds of the Atlantic Ocean. 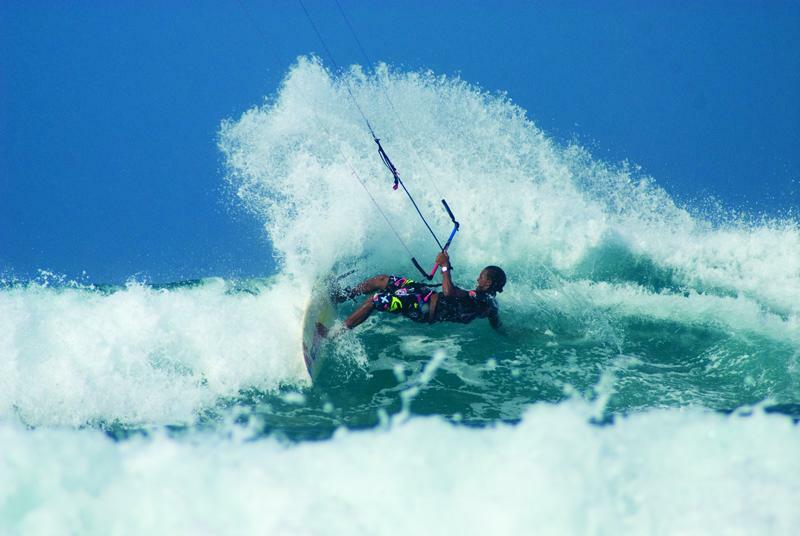 At nearby Cabarete, the ideal wind and water conditions have garnered it the reputation of “windsports capital of the world.” Both Playa Cabarete and Kite Beach attract windsurfers, kiteboarders and traditional board surfers. What was once a sleepy little town has exploded onto the world scene as a busy sports centre, lined with bars, restaurants, souvenir shops and tour operators. The calmer waters at Playa Dorada are protected by offshore reefs, and are a better choice for those looking for a beach chair, a good book, and the occasional dip into the blue-green waters. Non-guests wanting to use the facilities of the resort complex can purchase a day pass. The 14 resorts of Playa Dorada feature shopping, nightlife and casinos, restaurants and bars, horseback riding, tennis, movies and golf. Just east of Puerto Plata, the village of Sosua is known for its calm, clear turquoise waters. Sosua is a popular destination for swimming, snorkelling and glass bottom boat tours of the reefs. Experienced divers come for the wreck of a cargo ship and a dramatic reef wall, home to numerous fish, sponges and corals. At Ocean World Adventure Park in nearby Playa Cofresí, visitors learn about the ocean and have the chance to get up close to dolphins, sea lions, sharks, stingrays and exotic tropical birds. The marine park features the largest man-made dolphin habitat in the world, a bird sanctuary, a coral reef aquarium and dozens of interactive animal programs each day. The Ocean World complex also contains a world-class marina and aquatic-themed casino. 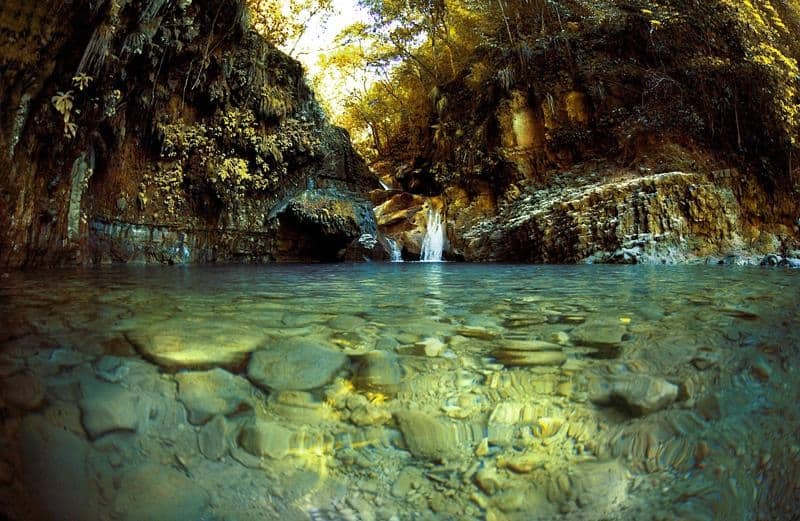 Just a half-hour from Puerto Plata, the beautiful Waterfalls of Damajagua is a popular excursion for canyoning and cascading. These popular adventure sports involve climbing a series of waterfalls, then jumping off cliffs or sliding down water chutes to get back to the bottom. The cascading course at Damajagua has a staggering 27 waterfalls. Ten platforms plus eight strong cables equals a major adrenaline rush at the zip lining course at Yasika Adventures, just 30 minutes outside of Puerto Plata. With the proper equipment, flying through the air along a zip line is a once-in-a-lifetime experience. Eighteen glorious holes of challenging golf at the Playa Dorada Golf Club, designed by Robert Trent Jones Sr., wrap around the Playa Dorada resort complex and along the coast. Just east of Puerto Plata (close to Rio San Juan) the Playa Grande course – also designed by the legendary Robert Trent Jones Sr. – has been described as “the Pebble Beach of the Caribbean.” With 10 of the 18 holes played along the ocean, dramatic cliff-side fairways and wide open vistas, this course provides a challenge for golfers of all skill levels. With a backdrop of mountains on one side and turquoise waters on the other, Puerto Plata abounds in jaw-dropping natural beauty. And from small local markets to the larger shopping complexes at Playa Dorada, the area’s shopping destinations offer spectacular sights as well. Dominican Republic Tourism BoardThe famous amber of the Dominican Republic can be found at the gift shop at the Amber Museum, at small shops in the Old City and in boutiques in Playa Dorada. The region around Puerto Plata contains among the largest deposits of amber in the world. From Monday through Saturday, the Mercado Nuevo is a local market bursting with Dominican and Haitian art, island rum, cigars, bottles of vanilla, tropical fruit marmalades and souvenir handicrafts. The Playa Dorada Plaza is a must-stop for serious shoppers. The 80-store shopping district includes shops specializing in jewelry and amber, fine fashion, gifts and specialty foods. 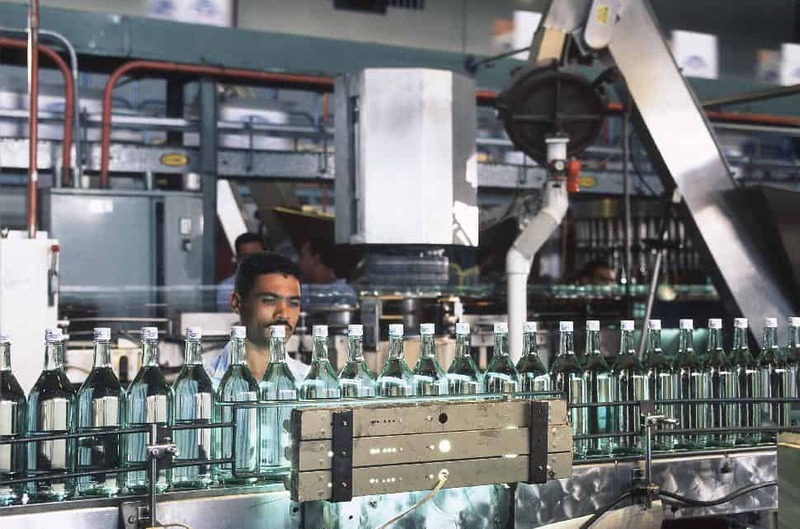 Dominican Republic Tourism BoardIn Puerto Plata, the popular Brugal Rum Factory Tour guides visitors through the process of making the island’s signature liquor. Tours are followed by a tasting time and a chance to shop for the distillery’s products. A stroll along the beach usually involves chances to stop at the many beachfront stalls that sell local snacks, handicrafts and souvenirs. Besides getting a shopping “fix,” it’s a wonderful way to interact with the locals.